Loaded with flavor, this grilled cheese is sure to please! Warm oil in a large, nonstick skillet over medium-high heat. Add steak; stir-fry until meat is no longer pink. Remove steak from pan; drain. 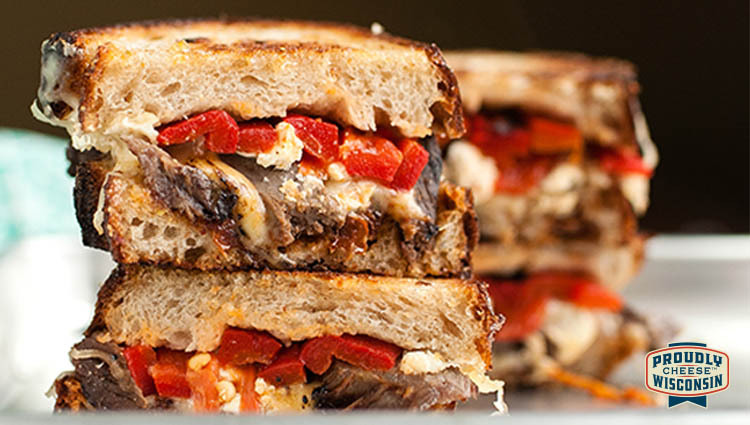 Layer six slices of bread with 1/4 cup mozzarella, steak and red peppers. Sprinkle with the remaining mozzarella and 2 tablespoons feta. Drizzle each with 1 teaspoon Sriracha hot chili sauce. Top with remaining bread slices. Spread outsides of sandwiches with butter. Toast sandwiches on a griddle or in a warm skillet over medium heat for 4-5 minutes on each side or until bread is lightly golden brown and mozzarella is melted.